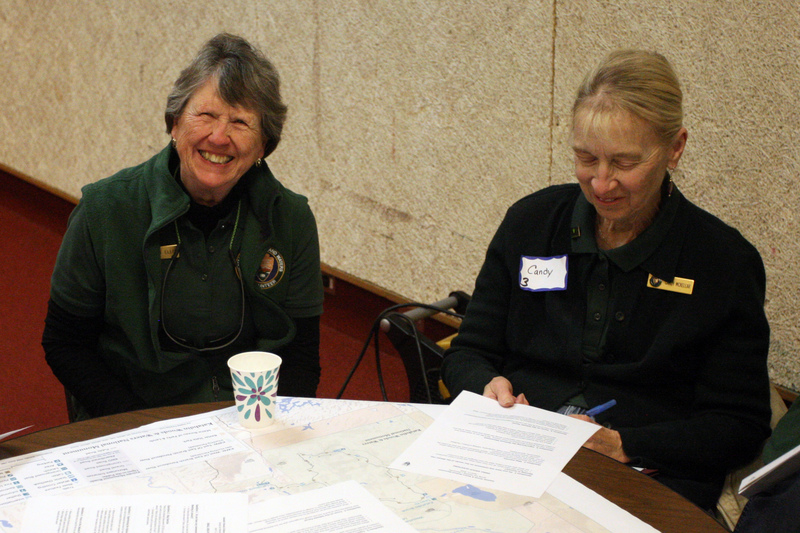 A mixture of town officials, outdoor enthusiasts and local residents gathered at the Katahdin Area High School on Wednesday to voice their concerns and ideas about how to manage the Katahdin Woods and Waters National Monument. 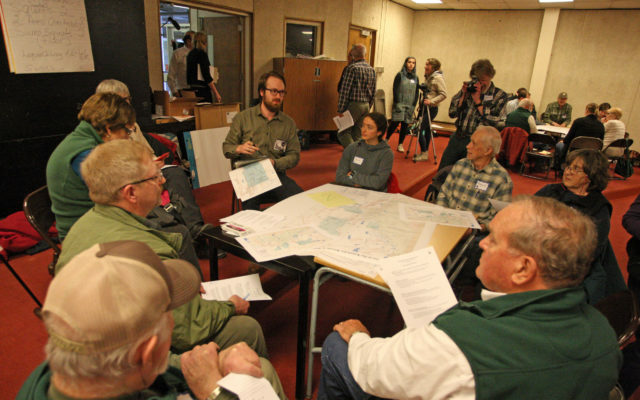 STACYVILLE, Maine — A mixture of town officials, outdoor enthusiasts and local residents gathered at the Katahdin Area High School on Wednesday to voice their concerns and ideas about how to manage the Katahdin Woods and Waters National Monument. 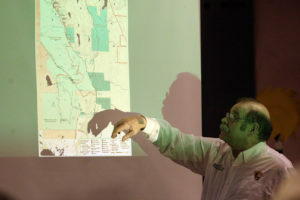 Tim Hudson, superintendent of the Katahdin Woods and Waters National Monument, goes over a map of the national park during a public meeting Wednesday, April 11, at Katahdin Area High School. A group of about 60 individuals attended the planning meeting, which featured a brief update on the monument before individuals broke up into smaller groups to review maps of the park and address any concerns they may have or items they would like to see added in the future. The spring meeting was the second of several public forums slated for 2018 to gather suggestions for the monument’s management plan, being compiled by the Musson Group, a planning and economic development agency based out of Southwest Harbor. That plan is due to be completed in 2019. Noel Musson, principal for the Musson Group, explained that the purpose of the meeting wasn’t to present data on the park but to gather feedback from those in the local region. Still, Tim Hudson, superintendent of the monument, gave a brief update on the winter sessions and stressed that one area in particular of the KWW was in need of greater attention. Hudson said the goal for the many separate parcels of land that make up the KWW is to provide the best experiences on a wide variety of uses. 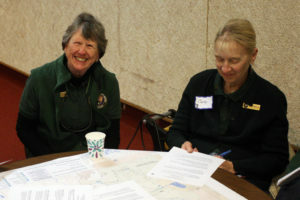 Lou Ellis Grant, left, and Candy McKellar participate in a small group panel discussion about the Katahdin Woods and Waters National Monument Wednesday, April 11, at Katahdin Area High School. “It’s all about having as many quality experiences we can on these lands to support the natural and cultural resources that are here,” he said. The management plan is intended to better define the monument, its features and processes to make the location as attractive as possible to visitors while balancing the needs and desires of neighbors and stakeholders. In the winter session, held in Millinocket, participants addressed dog sledding, skijoring, winter camping, skiing, snowshoeing, snowmobiling, birding and ice fishing. Suggestions included new access roads and parking areas, improved trails, and the creation of lodges and cabins for overnight visitors. During the April 11 session, access to the park was a recurring theme. Raymond Foss, town manager for Patten and town administrator for Hersey, said access to the parcel of land to the west of Patten was tricky at best. One of the primary access points for this parcel is an unimproved road known as the American Thread Road, located on the corner of Waters and Frenchville roads. He also said adequate parking was another issue that should be considered. Foss added that even the main entrance, located off the Swift Brook Road had places that were not ideal for smaller vehicles. 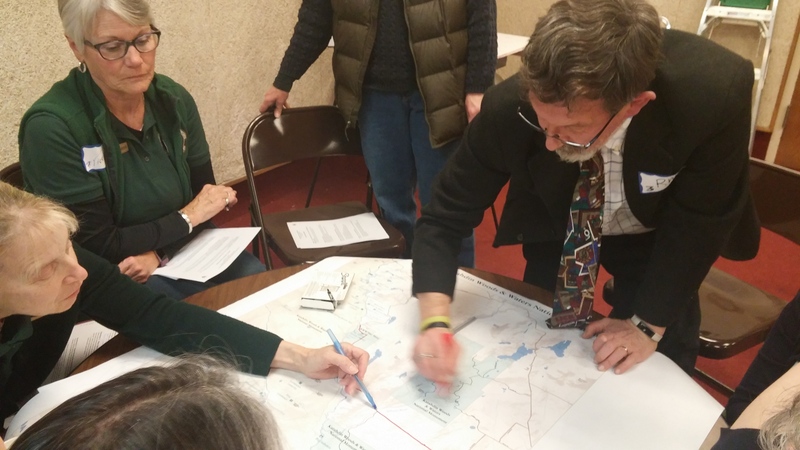 Patten Town Manager Raymond Foss, right, draws on a map of the Katahdin Woods and Waters National Monument highlighting an area that is in need of better road conditions to access the park. Lou Ellis Grant of Patten said she was encouraged by the fact that the snowmobilers, snowshoers and cross country skiers were able to work well together this past winter on sharing the trails. “Working this cooperative thing is such a great thing to see happening,” she said. Then-President Barack Obama issued the executive order that designated the 87,500-acres in Penobscot County a national monument in August 2016. The region is a popular destination for outdoor recreation and home to a wide diversity of wildlife. The monument land was acquired by Burt’s Bees entrepreneur Roxanne Quimby and transferred to the National Park Service in 13 different parcels with the deeds for each containing provisions to protect or prohibit certain types of recreational use. For example, hunting — except for bear baiting and hounding — is protected in the monument east of the East Branch of the Penobscot River. Snowmobiling is prohibited west of the Penobscot, though some at the meeting pushed for expanded access. Access to the monument remains one of the bigger sticking points for many people. The roads that provide access to the southern part of KWW, including the monument’s 16-mile Katahdin Loop Road, are closed to vehicles during the winter due to active logging operations. The Loop Road and the North Entrance (Matagamon) are expected to reopen in May 2018. Members of the public may still submit comments about the future management plan to kaww_superintendent@nps.gov.